Story originally published by the Orange County Register on Thursday, June 19, 2008. SATISFACTION: The band features, from left, bassist Aaron Wahlman, keyboardist Matthew Fletcher, singer-guitarist Michael Rosas and drummer Michael Nielsen (who is temporarily filling in for regular percussionist James Fletcher this month). 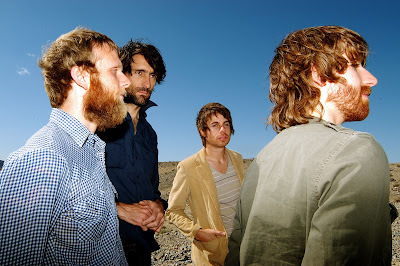 The capacity crowd that caught Matt Costa's headlining show at the Samueli Theater in Costa Mesa on April 24 was collectively and pleasantly caught off guard by the powerful opening act, Orange County's own Satisfaction. I was among the countless concert-goers who won't soon forget the powerful performance that singer-guitarist Michael Rosas, keyboardist Matthew Fletcher, bassist Aaron Wahlman and drummer James Fletcher delivered that night. Led by ex-Smile front man Rosas, the quartet's propulsive attack was truly formidable. Rousing performances of songs such as "So We'll Just Take the Night" and "Feel So Stupid" were among the highlights of Satisfaction's 40-minute set. But don't fret if you missed that terrific show two months ago; Satisfaction will be featuring songs from the band's latest CD "Cougars, Sharks & Flying Sparks" at a number of upcoming performances over the next few weeks. Satisfaction is that rare and gifted musical chameleon able to deliver songs that rock without losing their melodic way. And the group's original tunes somehow fuse the best of 1970s artists such as Paul McCartney & Wings and Harry Nilsson with the modern attack of neo-new wave proponents such as Kaiser Chiefs and Franz Ferdinand. "The ideas that have stuck for us are things that we (initially) throw out and ourselves then laughed about at first," Rosas explained earlier this week at a Costa Mesa coffeehouse before he headed off to rehearsal. "It was something ridiculous and then we say, 'No, we should really do that.' The less we think about it in the creative process, the better it comes out," Rosas said. When asked to provide more details about how the four members of Satisfaction craft their songs, he added: "Like any band, (we) filter the things we don't like and embrace the things we do like." Satisfaction's blend of strong chemistry among the members, winning vocals, virtuoso musicianship and timeless sound make for something special. "We like a lot of music that's commercial, but also like things underground and indie. We try to inject a bit of avant-garde into the sound," Rosas said. Performing together since 2004, the four members came together out of the burgeoning Costa Mesa music scene that revolves around the Detroit Bar. Now the group is playing high-profile shows at celebrated venues and has scored airplay on both Indie 103.1 FM and KROQ/106.7 FM. "We feel really lucky to be in a band like this. We are four distinct personalities on stage," Matthew Fletcher said of band's music and strong friendships established within the outfit. "I will be able to someday play this (music) for my grandkids and they'll say, 'Whoa, this is amazing,'" Matthew Fletcher said. Satisfaction will headline at La Cave in Costa Mesa at 9 p.m. on June 25, open for the Shys at OC Tavern in San Clemente at 8 p.m. on June 26 and open for the 88 at the Roxy in West Hollywood at 8 p.m. on June 28. Although Plena Libre won’t release its next CD “Plena al Salsero – Live in Monterrey, Mexico” until June 17, fans of the group can get a preview of that album when they catch the ensemble perform as part of the Music at the Library concert series in San Juan Capistrano on June 14. Founded by composer/bass player Gary Núñez, Plena Libre has released a dozen albums that have earned the troupe four Grammy nominations. Plena Libre’s most recent CD, the Grammy- and Latin Grammy-nominated “Evolución,” was released in 2006. 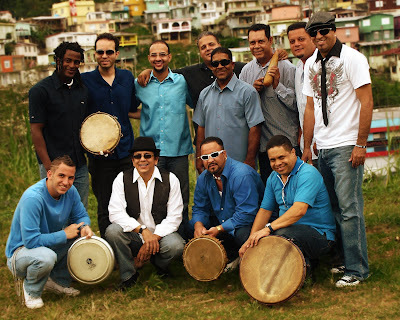 “Plena al Salsero” will be the group’s 13th full-length album. “This idea of a live recording was something that I had been encouraged to do for years,” Núñez said in a recently-posted update on Plena Libre's official Web site. So in November 2007, with Plena Libre invited to perform five concerts in Monterrey, Mexico. After performing the first two shows, Núñez realized the setting and sound was perfect to complete a concert recording. He found a recording studio titled El Cielo Recording Studios (“Heaven” in English) and it happened the engineer was able to bring all of his equipment to Monterrey’s Parque Fundidora on short notice to perform the final nights. Fusing the sounds of Puerto Rico’s plena and bomba sonic traditions with African-styled rhythms, Plena Libre has been featured on celebrated stages such as New York’s Lincoln Center and Washington D.C.’s Kennedy Center. But local audiences in Orange County can be thrilled that Plena Libre is celebrating the release of “Plena al Salsero” with two special shows in San Juan Capistrano on Saturday night. Plena Libre will perform at San Juan Capistrano Regional Library, 31495 El Camino Real, San Juan Capistrano, at 6:30 p.m. and again at 8:30 p.m. on Saturday, June 14. Tickets are either show are $10 for adults and $5 for children under the age of 12. Aimee Mann as photographed by Kelly A. Swift on June 6 at House of Blues, Anaheim. Aimee Mann's melodic folk rock sounds nothing like the loose, freewheeling mix of alt country folk and rock 'n' roll grunge pioneered by Neil Young, but the two artists do have something in common. Both artists have unique voices and styles that involve listeners for reasons related to powerful songwriting and how those songs eternally seem to work their magic as we go through life. If what I'm writing here doesn't make very much sense, check out Aimee Mann's latest CD, "@#%$*! Smilers," and then make sure to catch her in concert as soon as possible. For my part, I couldn't have been more pleased with her amazing performance at House of Blues, Anaheim, on Friday, June 6. 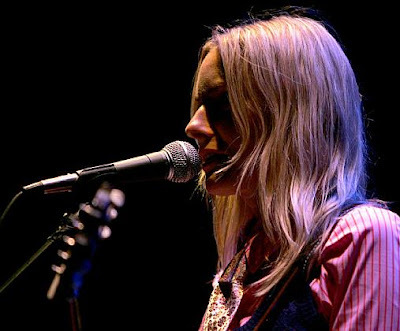 In addition to her role on lead vocals, acoustic guitars and keyboards, Mann was backed by a simple two-man lineup of bassist Paul Bryant and keyboardist Jamie Edwards. But the sparse lineup and compelling arrangements suited material from throughout her career delivered well on this night early in her summer tour. She began her set featuring material from her latest CD, including opening with the infectious single "Freeway" and going on to play many of that disc's greatest tracks, including "31 Today" and "Medicine Wheel." She also played several reworked covers (a highlight being Elton John's "My Father's Gun") and plenty of surefire works from her own career. "Red Vines" and "Invisible Ink." She was relaxed and sang and told stories and it was a wonderful night. By the time she finished with a rocking version of "Deathly," I knew I had just caught one of my favorite shows of 2008.